Well I had been staring at this book for the best part of six months before finally deciding that I must, at last, start to read it. The hour is getting late and the time when I should be handing in my dissertation ever nearer. In Xanadu: A Quest was written in the late 1980s by a William Dalrymple, a student of Trinity College, Cambridge. It is also one of five books that I have chosen to base my dissertation on. 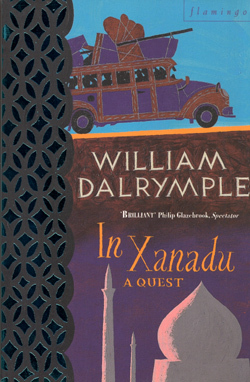 The title as it stands is: How far has the travel writing of the 18th Century influenced the travel writing of William Dalrymple and Chris Stewart? If you're thinking 'what the hell', then fear not. It is me who needs to know and understand what I'm writing about - not you! For some reason, out of all the subjects I have studied in English Literature, the stuff that struck a chord with me most is 'the old stuff' and in particular 18th Century traveller's tales (mainly thanks to the great John Gilroy). Anyway, the book. It is a piece of classic travel writing. There are run-ins with authorities, crossing unsafe territories, mad Pakistanis, avoiding the Mujahadeen and Soviets and a Singaporean man obsessed with 'fly chikky' (Fried Chickens). In amongst all of the obvious culture changes, and shock that this entails, there are moments of picturesque beauty in the descriptions of landscapes and the people that he and his travelling partners (they change during the book) encounter. What makes this book's content all the more better is the fact that it is real. The journey mirrors that of the Venetian merchant traveller Marco Polo along various trade routes from the Holy Land to Xanadu, the summer palace of the Mongolian Emperor, Kublai Khan. Those of you who have studied Romanticism or read Samuel Taylor Coleridge's work will recognise that he wrote a poem called Kubla Khan whilst waking up from an opium-induced dream. Anyway it's worthless me explaining any further. I will have, after all, studied this book to death by the time my dissertation is written. All I can say is that if you feel like reading because you haven't done so for a while, or, like me, you have a passion for travellers' tales, then pick up a copy of this book (or borrow my copy if you ever see me around). I guarantee it will inspire even the most uninspired to go on a journey of their own.